Engage students in the scientific literature differentiating being reviews and the primary literature. To encourage students to synthesize their own connections between core principles of inorganic chemistry and applications that have societal impact. 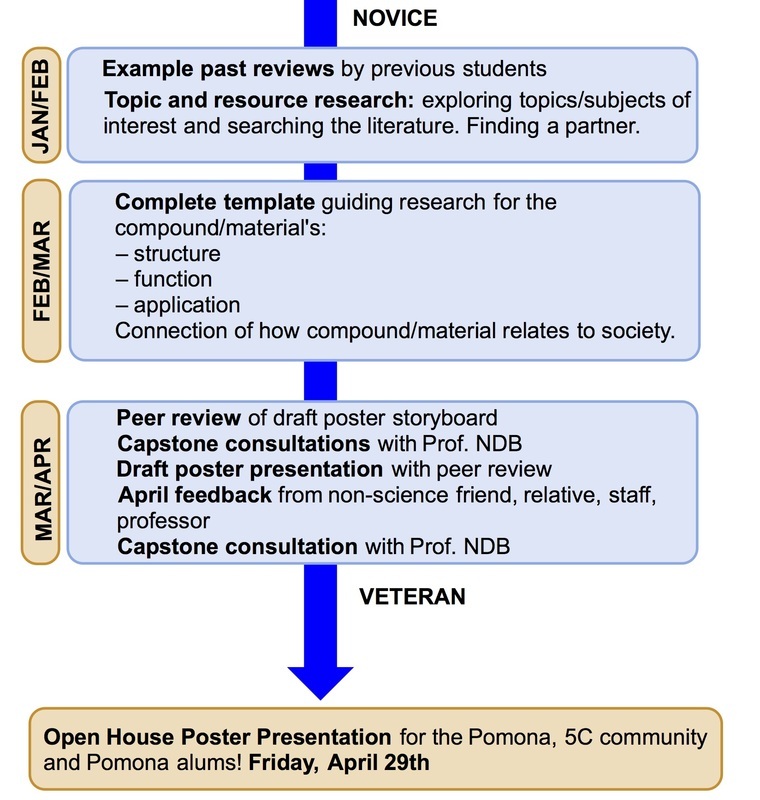 Strengthen students' oral communication skills by having them present and target their poster to a general audience (alumni, their fellow students, out of field scientist). This is an upper -level course. This project is meant to help students transfer their technical knowledge in a way that is readily accessible with the aim of providing students with some training on how to be an effective communicator of science. Develop skills working as a team. Assignments are given throughout the semester, breaking the work in manageable sections. The goal of the assignments is to guide the students through a process that helps them develop to a novice to a veteran on the topic. The idea is that by the end of the semester they will have a sufficient proficiency in explaining the core concepts and inorganic principle behind their topic. Judges were a 50:50 mix of faculty members (from the Pomona Chemistry department) and students (second semester organic chemistry class). Focus more on both partners sharing equal time presenting the poster. Invite more members from the 5C community to come. Students had to invite 3 people to the poster session, I will require one of those invites to be a 5C staff or faculty member. Change the judges title to evaluators to make it more clear there isn't a prize. The role of the evaluator is to provide feedback (based on a given rubric) their perception of the presentation. Their feedback in excellent for the instructor in that it provides an fresh perspective on the students' poster and oral presentation. Develop a formal student feedback process to compare the project over a period of years. Relate that data to their performance in the course. Send invitation to chemistry alumni to attend the event via the Alumni office. Invite more students and faculty from the other 5C chemistry departments. Think of joint efforts for the future with Pomona and 5C faculty. * Posters were upload to this site with the written permission of the students. If you would like more information about the project or want a copy of the course materials, please contact me.